Randy Webb leads the workshop on creating unique characters. Ever get the feedback on your script that all your characters seem alike? Did you frantically search online for “ways to make characters unique,” only to come back with hundreds of results because everyone has a different idea or tool that they use? Randy Webb, online instructor for NY University teaching applied behavioral psychology, led an informative workshop on using one such tool, the Myers-Briggs Type Indicator. After a brief introduction to the concepts of the psychological analysis tool, attendees chose a character that they knew well from a movie or television show and completed a chart answering as if they were that character. The results were quite accurate! Attendees were instructed on the different preferences of personality types and why they would react differently under the same situations based on the strengths and weaknesses of the way they perceive the world. How does this help shape your characters? Do you have a plot and need to know what kind of person to put in the situation? Or have you created an antagonist and a protagonist with opposing personality types that by definition pit them against each other? While using the MBTI is a fun and interesting tool, Webb cautions against taking the results too far. Remember, just like actors, we can all pretend to be someone else for a while. Perhaps that is what your character is doing! 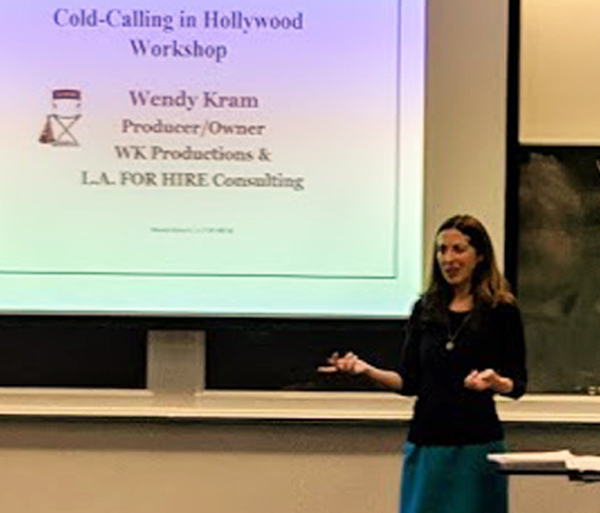 This was part of the Northwest Screenwriters Guild 2019 workshop series. One of the best things I ever did to improve my screenwriting was join a website called Trigger Street Labs. I discovered it somewhere around 2008 and spent a large amount of time and effort there for a couple of years. The concept was simple: give feedback on other people’s screenplays and other people would give feedback on yours. I learned the secret of the site’s real value pretty quickly: I got much more out of the reviews I completed for other people than I did from the feedback I received on my own work. The key is giving good notes. They should be honest and helpful. You may give feedback on a script that is better than anything you’ll ever write. I did. It was called PURE, and it went on to win a Nichols Fellowship in 2009. Or you may find yourself slogging through a mess of words that can only charitably be called a screenplay. Either way, your job should be to provide whatever assistance you can with the sincere intent of improving the work. Honest notes can feel like an attack to a writer. Trust me though, you need them. Reading through that feedback of your work can be so painful, especially early on. That is perfectly normal to feel when someone is critical of a thing into which you’ve poured your heart and soul. If your goal is to improve as a writer, you’ll want to thicken up your skin to the point that you can shrug off the pain and knee-jerk defensiveness and get down to the hard work of making your script the best it can be. You also want people in your life who will be honest with you about your work. A good friend who will look you in the eye and tell you what doesn’t work about your script without fear of losing your friendship is a valuable thing. If you can be that friend for others, you will find the people you need in your life as a writer. Trigger Street Labs is gone now, which is a shame. I have heard The Black List runs a similar program these days, but haven’t had the time to look into it for myself. Most of my recent script notes have gone out to members of the Northwest Screenwriters Guild who have submitted work to be considered for Compendium status. If you are a member of the Guild with work you feel is ready to be seen by industry professionals, I encourage you to get a script in for review. Long-time Northwest Screenwriter Guild member and former board member Wally Lane has started a scene analysis group that meets weekly in Seattle. It’s free and open to all. First and foremost, to assist fellow screenwriters hone the craft of writing scenes—both action and dialogue—that are cinematic, engaging and correctly formatted. Bring some scenes or a sequence (3-4 pages) from your screenplay. Together, we do a table read (aloud) of your material, then critique and offer suggestions. Nothing (unless you care to purchase affordable food &/drinks on-site). A chance to hear portions of your work read (by real people, not the Final Draft robot). Receive suggestions to improve the material, point out errors and/or problem areas, and how to correct them. This is a free event and it is open to all screenwriters… we welcome pros and tyros alike. First Rule of the SSAG: Treat other screenwriters as you’d like to be treated. Our mutual aim is to improve our skills (not hurt someone’s feelings). We can be constructive and civil at the same time. In other words, play nice and be friendly. Guild President Geof Miller introduces the script reading event, featuring SAG-AFTRA actors reading material by NWSG screenwriters. 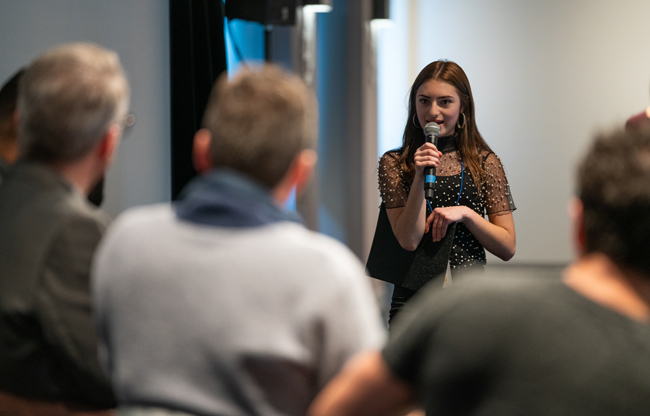 Members of the Northwest Screenwriters Guild had the pleasure of hearing portions of their screenplays brought to life by professional actors, in an event co-sponsored by the Seattle SAG-AFTRA chapter. 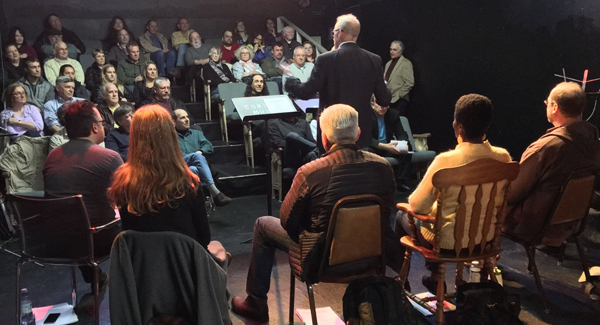 Held March 12 at the Eclectic Theater, the event featured script excerpts from a broad range of genres, and was followed by a question-and-answer session with the screenwriters. While screenwriting programs such as Final Draft have a text-to-speech feature that allows you to assign different voices to the characters in your script, there is no substitute to hearing your script read by professional actors. That’s why the NWSG teamed up with SAG-AFTRA, not only for the benefit of some of our screenwriters, but also to provide the opportunity for actors to exercise their skills, and demonstrate their range should any of the featured projects move forward to production. THE ELEPHANT ROOM by Tom Kennedy – directed by George Thomas Jr.
SUPER GEEKS by Mark Robyn – directed by George Thomas Jr. This is one example of the types of events the NWSG will sponsor throughout the year. If you’re active on social media, like our Facebook page, connect with us on Twitter, or get on our email list (see the right panel to subscribe).